In the Protestant service of worship the congregation talk to God through prayer and praise. A Protestant service of worship should be celebrated at least on every Sunday and on every church festival day. The classic definition of a service of worship was provided by the Reformer Martin Luther at the consecration of the world’s first newly built Protestant church, the Hartenfels Castle chapel in Torgau on 5 October 1544, when he laid down that the intention of the new building was “that nothing else shall happen inside it except that our dear Lord shall speak to us through His Holy Word, and we in turn talk to Him through prayer and praise”. The service of worship is a dialogue, not just between God and the individual person, but also between people with one another and a dialogue of the individual with him or herself. This happens in a variety of forms, including “children’s church”, family services, baby and toddler services, school services, peace services and Evensong. The local church council (“Presbyterium”) has the overall responsibility for the provision of worship in the local parish. The actual service is led by a minister, a lay preacher or a reader. God accepts all people just as they are, but he does not leave them as they are. Repentance and conversion are not preconditions for the forgiveness of sin but are the “fruit” that follows from it. This theological insight is consequently carried over into the celebration of communion. All those who have been baptised are invited to the Lord’s table, regardless of their denomination or their situation in life. 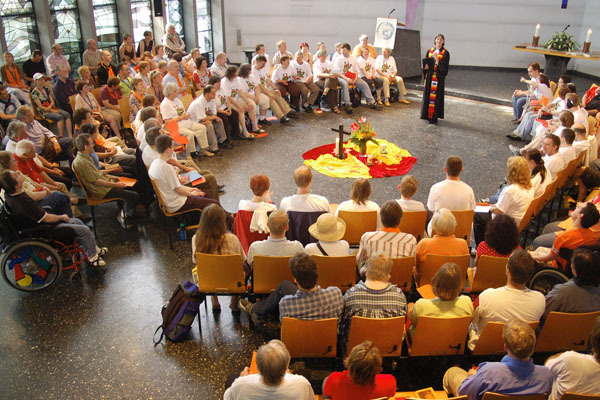 This understanding of communion also means that in many local congregations of the Evangelical Church in the Rhineland children are also permitted to join in the celebration of communion.